“My Baby Pet Hotel 3D” from TREVA Entertainment offers plenty to enjoy. From today animal besotted hotel owners will be able to spoil and stroke their baby animal charges and even train foals on a lunge line – all in the Nintendo eShop on the Nintendo 3DS™ hand-held system. Hamburg, 07th November 2013 – Any young animal lover can now take on running their own pet hotel exclusively for frisky baby pets. Hours of fun on the Nintendo 3DS are guaranteed when puppies, foals, kittens, cute little guinea pigs, rabbits and birds are all handed over by their owners into the player’s care. This means generous enclosures for the animals, any number of treats and an exclusive care programme. Because it’s important to know the guests’ individual needs and to make sure that they don’t want for anything. And all this involves plenty of fun in mini-games such as fetch, teaching tricks and even singing games with the birds, using the Nintendo 3DS microphone. Players take care of all of their cute guests’ needs, while developing and enlarging their animal hotel and doing all the necessary shopping in the nearby town. This is how the animals are provided with food, medicines and all kinds of toys. There are also luxury goods and equipment items to be bought. The young hoteliers are right in the thick of it when it comes to knowing the needs of their playful guests. 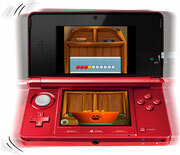 The plentiful missions and side missions let them show what they are made of, such as using the cleverly adapted movement control: So to mix food the Nintendo 3DS quickly becomes a feeding trough and has to be deftly rocked from left to right to create the correct blend. In a similar way the game character is steered through the forest during walkies while at the same time collecting stars en route to earn a reward at the end. Training the foals on a lunge line has a realistic feel. Just like a real lunge line, the screen always has to be held at the height of the foal which, especially with the faster paced exercises, is a particular challenge for the player. And so in a charming 3D world the world’s greatest animal hotel for frisky baby pets gradually comes into being. Entertaining mini-games such as fetch, teaching tricks, singing games using the Nintendo 3DS microphone and more. Cool movement control: Mix food or go walkies by tilting the Nintendo 3DS and train foals on a lunge line by keeping the screen up at the height of the foal. “My Baby Pet Hotel 3D” is available right now at € 29,99 / $29.99 in the Nintendo eShop on Nintendo 3DS, the virtual destination for all digital content. The game has been developed by Independent Arts Software, Germany. Download artworks and more on our Press Server.